TurboTax is the nation’s leading tax preparation software from Intuit Inc. TurboTax makes it easy for Americans to prepare and file both federal and state income tax returns quickly and accurately. Since it was founded in the mid-1980s, TurboTax has relied on word of mouth marketing as its primary growth driver. Over the past four years, TurboTax has increased its presence in social media channels like Twitter as an additional way to engage with its more than 20 million customers. 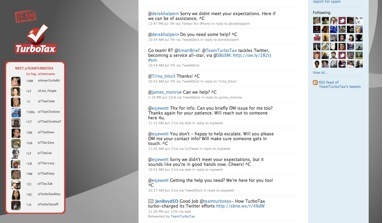 This year, TurboTax launched @TeamTurboTax, a group of 40 tax and technical experts with a primary mission: help customers on Twitter during their point of need during tax season. What Makes it an Effective Use of Social Applications? TurboTax has a track record of using communities to help customers get answers to their tax and technical support questions. Its Live Community has been used by more than 10 million people since it was introduced three years ago. This year, TurboTax created the @TeamTurboTax Twitter presence, as well as a process to enable the company to quickly and proactively address customer matters in short form. 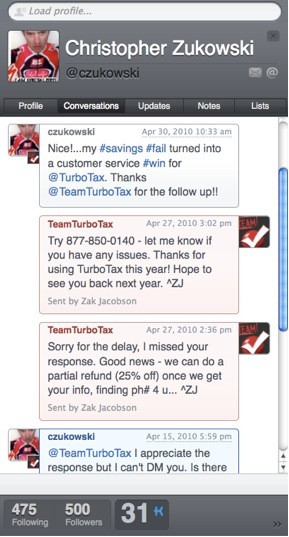 And because Twitter is a public social media tool, TurboTax has been able to better meet their customers where they’re at, providing help almost immediately after a question is raised. Get to know our rockstars. Read another perspective on @TeamTurboTax.